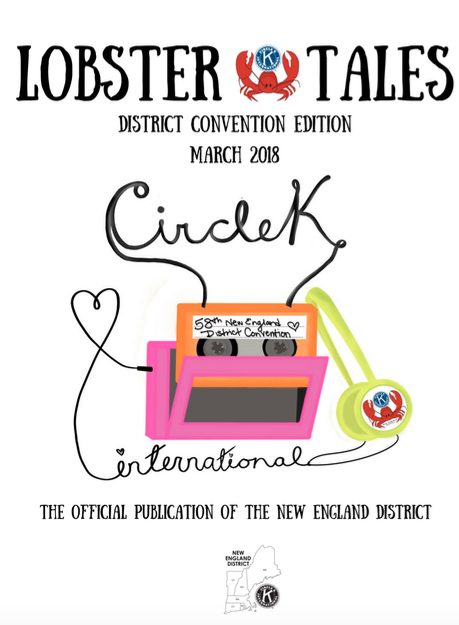 Click the button to subscribe to our monthly Lobster Tales newsletter for general information regarding the Circle K clubs in New England, district events, and other updates! Joining Circle K after having been a part of key club for four years, district conventions weren’t unfamiliar to me. Caucusing, elections, workshops, awards, and food. Minus the “E” from high school DECONs, I was expecting the weekend of convention to be just as tiring, yet inspirational as my previous experiences were. However, settling into the hotel on day one of DCON 2018, I knew this was no Key Club Convention. The crowded common rooms and long registration lines I was picturing turned out to be rooms comfortably filled with groups of passionate and hardworking individuals I’d soon meet and get to know. The potential for growth in our organization and home clubs was always present in the many workshops that were presented. Skills on leadership, marketing, recruitment and more were passed from people who have lead successful clubs to those that were there to listen, and bring back to their own clubs. Though there are many things to learn at DCON, what I remember most are the nights of service projects, competing against groups during different games, or getting slices of pie from the diner next door. There was never a dull moment. This made for an exhausting weekend, but one filled with opportunistic networking and blossoming friendships, one that made me appreciate the absence of the thousands of members that I was used to back in high school. 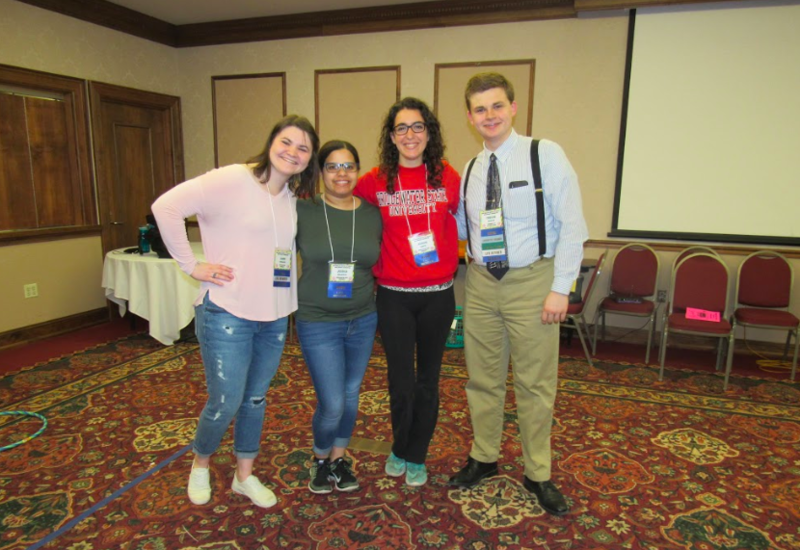 The sense of community was blatantly apparent throughout the weekend, everyone was there for the good of Circle K, so it was easy to talk to other people and connect with members from schools all around New England. Being close with and learning from people that share similar goals is what makes DCON such an important place to be, especially if you’re looking to join any executive board. District convention wrangles in some very dedicated club members and officers to award their hard work over the past service year, elect the next students to lead on the district board, and bring together ideas that foster inspiration for the upcoming year. I’m looking forward to attending again this year, to see familiar faces once again and absorb everything there is to learn and use it to help my club throughout the next service year! My favorite part about DCON is being able to bond more with my home club. It’s a great opportunity to get to know your club members, and to meet new people and make friends in Circle K clubs across the New England District! It’s also great to be able to share ideas on new community service projects, and hear about the events that other clubs host for their school and surrounding community! Attending D-CON was such a great experience for me. I got to meet so many circle k members who I still keep in touch with today from many different schools. It also was cool to learn about circle k on a different more formal level and learn all about the district board and how it works! I recommend this event to all circle k members new and old! Going into Fall Retreat this past weekend, I had no idea what to expect. I was nervous that I wouldn’t make new connections with people outside of college; I was anxious that I was only a freshman and just barely became Vice President. I could not have had a better experience at the NED Fall Retreat. It was an experience that, as someone new to Circle K, was invaluable in showing me what a great service leader looks like. Throughout the weekend, the twenty of us were holed up in a quaint cabin playing leadership games, working on service projects, and encouraging fellowship with one another. I met people all across the New England District: Northeastern, Johnson And Wales, and Simmons University all sent their kindest, most compassionate Circle K members to this weekend. In just one short weekend, these people became my confidants and my friends. I learned so much from these Circle Kers about the true meaning of service and fellowship. Coming from a relatively small club, it was so great to get advice from others on how to grow our club and foster new programs at UNH. Through activities throughout the weekend, I learned what kind of leader I am. I learned how to debate a topic even if I don’t agree with the side I’m on. I learned how to communicate through telling my teammates how to paint an outrageous picture without being able to see it. (No matter the final scores, the Jugglers were the best team out there for sure). These activities were not only building leadership in me, but connecting me to my teammates and creating a long lasting friendship. The theme of this year’s Fall Retreat was “Carnival,” and the Events Committee did a fantastic job of decorating the cabin and keeping us in the carnival spirit. We played carnival games and I really felt like I was at the county fair the whole time! The weekend was so fun and engaging, and there was never a moment where I was bored. I am ecstatic that I got the opportunity to go on this retreat as a first year so I can bring back these experiences and share them with my club for the next four years. Fall Retreat brought me great new friends, new leadership tactics, and an even deeper love for service. I cannot wait to go back next year! What began with President Franklin D. Roosevelt's personal struggle with polio led to the creation of the National Foundation for Infantile Paralysis, better known as March of Dimes, and ultimately a cure for the disease. With that success behind us, we began to focus on fighting birth defects, premature birth and infant death with innovations like newborn screenings and surfactant therapy; education for medical professionals and the public about best practices; and lifesaving research. We provided comfort and support to families in NICUs and advocated for those who needed us most, moms and babies. Today we are stronger and more committed than ever to guiding moms through every stage of the pregnancy journey. We are fighting for the smallest among us and advocating for their health each and every day. And we do so with the tools, technology and knowledge needed to build a brighter future for us all. Light Your School in Purple – Work with your administration to help spread the color purple. Make ribbons, wear purple, and decorate your campus purple. Get involved at your local hospital! – Visit your local Neonatal Intensive Care Unit (NICU) and see how you and your club can help. Service Projects Ideas – No-Sew Blankets for your local NICU Babies, Puzzles/Coloring Books for NICU Siblings, Cards of Appreciation for our NICU Nurses! March for Babies! - This is a great opportunity for your chapter or your division to participate together!